Stephen Langlois is a writer of the fantastic and absurd. His work has appeared in or is forthcoming from Glimmer Train, The Portland Review, 3AM Magazine, Monkeybicycle, Matchbook Litmag, Necessary Fiction, Pacifica Literary Review, Profane Journal, Burrow Press Review, Big Lucks, and glitterMOB, among others. He is a recipient of a NYC Emerging Writers Fellowship from The Center for Fiction as well as a writing residency from the Blue Mountain Center. 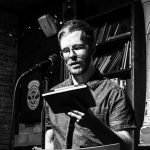 He also hosts BREW: An Evening of Literary Works, a reading series held in Brooklyn, and serves as the fiction editor for FLAPPERHOUSE. Visit him at www.stephenmlanglois.com or follow @stphnlanglois.